A Nendoroid of the first Fubuki-class special destroyer! Action figure includes 3 faces and a variety of effect parts. From the popular browser game Kantai Collection (aka KanColle), comes a Nendoroid of the first Fubuki-class special destroyer! 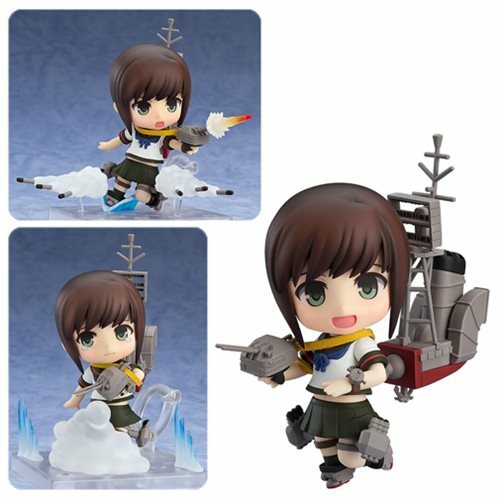 The Kantai Collection Fubuki Kai-II Nendoroid Action Figure comes with 3 face plates: standard expression, combat expression, and half-damaged expression. She also includes a variety of effect parts: turret firing, torpedo, machine-gun water pillar, smokescreen, and effect parts to display her gliding along the surface of the water! Fubuki measures approximately 4-inches tall.